I am getting the "VTech device not found" error. What can I do? Please ensure that you are using the USB cable that came included with your VTech® toy, or that is recommended for your VTech® toy. Check to make sure the USB cable is securely connected between your computer and the VTech® toy. Make sure to turn on the VTech® toy when you connect it to the computer. If this is successful, you will see a "Connected to Computer" message on your toy's screen (if it has a screen). 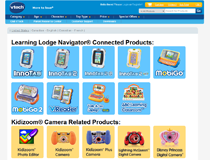 On the Learning Lodge Navigator® home screen, you should be able to see the connected badge appear on your VTech toy as well. There are different versions of Learning Lodge Navigator® available for different VTech® toys. Make sure you install the version that matches your toy. When you connect your VTech® toy to your computer, a few removable drives may appear when you look in your "My Computer" window. If you do not see any removable drives, then there might be a drive letter conflict. 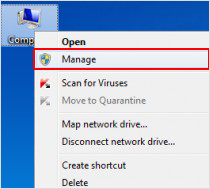 To check, right click on the "My Computer" icon and choose "Manage." In the window that comes up, look under the "Storage" section and find the "Disk Management" section. To the right, you will see a list of disk drives on your computer. You should be able to see a few "Removable" drives in the list. Look for any removable drives that have not had a drive letter assigned to them. If you find one, right click on it. Select the "Change Drive Letter and Paths..." option. On the screen that comes up, click the "Change..." button. Use the pull-down list to the right of the "Assign the following drive letter:" option to assign an unused drive letter to the removeable drive, and click "OK" to confirm the change. Try connecting the toy with a different USB cable. Try connecting to a different USB port. Connect the toy directly to the USB port of your computer, avoid using USB hub and keyboard/monitor USB extension. Email: Please utilize the "Contact Us" form located under the Customer Support link on our web site. 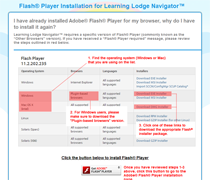 The Learning Lodge Navigator® is telling me to install Adobe® Flash® Player. 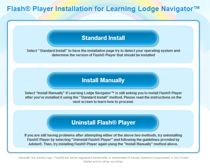 Learning Lodge Navigator requires a specific version of Flash® Player (commonly known as the “Other Browsers” version). If you have received a “Flash® Player required” message, please review the steps outlined below. Launch the Learning Lodge Navigator®, and click on the "My Account" option. The Learning Lodge Navigator® will prompt you to install Adobe® Flash® Player if you haven't already. Click "Yes" to continue. You will be given 3 options, choose the "Standard Install" option to have the installation page try to detect your operating system and determine the version of Flash® Player that should be installed. On the next page, click the "Download Now" button to continue, and the Flash® installation process will begin automatically. You will be given 3 options, choose the "Install Manually" option to install Flash® player manually. You can see the instruction on how to locate the correct Adobe® Flash® player plugin on this page. Click the "Get Adobe® Flash® Player" button at the bottom of the page to continue. On the page that comes up, find the latest version of Flash® Player from the list. Depending on the Operating System you are using, for Windows users, please select the "Plugin-based browsers" option. For Mac OSX users, select the "All supported browsers" option. Click the "Download EXE Installer" (For Windows), or "Download DMG Installer" (For Mac) to begin download. You will be given 3 options, choose the "Unistall Flash® Player" option to go to the Adobe® Flash® Uninstallation page. Follow the guidelines provided by Adobe® to uninstall Flash® player. Then, try installing again using the "Install Manually" method above.